As close as the men’s and women’s teams are in the College of the Rockies volleyball program, there are few players who make an impact no matter which team is playing. As a first year player, middle blocker Alex Avery hasn’t got a whole lot of playing time yet, but he has certainly let his presence be known. It’s early November and Alex Avery is working his hardest to pump up the crowd before the women’s Avalanche volleyball match against the visiting Capilano Blues. The team is having a tough time at this point in the season. A year after winning the BC PACWEST provincial championship, the women are 2-3 and are having trouble proving that they should still be recognized as one of the best in the country. The women have every reason to not be feeling great, but when they hear Avery they can’t help but smile. Avery’s team won’t be playing for another couple of hours, but he’s already hard at work. He’s made this his job. It’s the first weekend that he’s been in the starting rotation, and he should be nervous. His parents and even his grandparents have travelled miles to be here. He’s received so much support and is so thankful for it all. 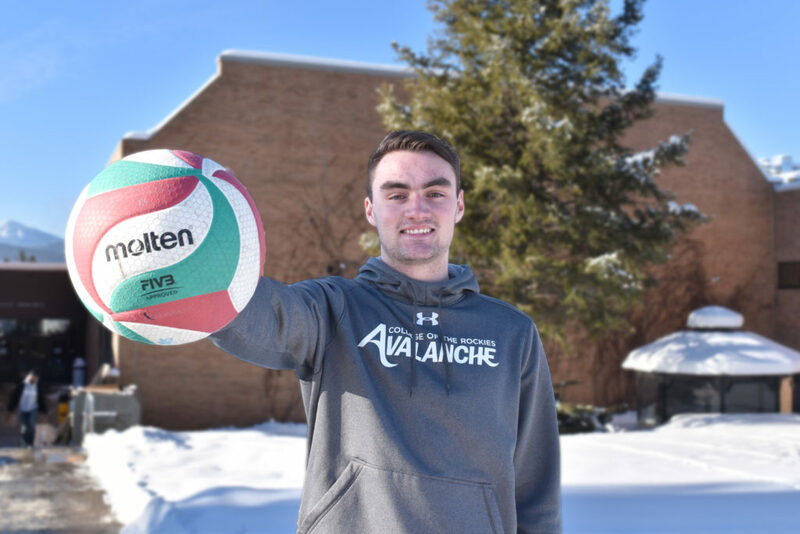 Avery first found out about College of the Rockies when he was in his final year of high school and desperately hoping to continue his volleyball career. “I was originally talking with Medicine Hat College and then they decided they didn’t want me,” Avery says on January afternoon from the COTR cafeteria. Away from the bright lights of the college gymnasium on a Friday night, he’s a lot more soft spoken. “I was helping coach my younger brother’s club team and his coach used to go to our high school and he’s a former [Avs] player. Growing up in Irricana, Alberta and playing for George McDougall High School in nearby Airdrie, Avery had a lot of early success in volleyball with three straight zone gold medals, a trip to Provincials and being named his team’s captain for his two final seasons. It was with his high school team that he not only developed into a top-end player, but also learned how to make noise off the court. His signature battle-cry “get out of your mind” is a product of that time. The phrase is one that Avery yells at the top of his lungs prior to most games. It never fails to get both the crowd and his fellow players hyped for the game. “I started saying [“get out of your mind”] in high school and it kind of took off,” he says with a sheepish grin. “All my teams loved it and it really brought the morale up. I feel it always got us excited and hyped up, so I just stuck with it. When asked what he thought his teammates would say about him, he laughs and thinks for a minute. When asked how he’d like them to think of him, he answers immediately. While the Alex Avery that COTR fans have come to know and love is naturally energetic and silly, at his core he’s a testament to grinding and to never giving up. While Avery has experienced a lot of sitting on the bench with the Avs so far this year — or standing near the bench, he’s not the type to relax much during a match — he has not let it discourage him one bit. “I think it really helps the guys out, especially in tense situations,” he says. “If you can crack a joke or something and just bring out the energy in guys, they tend to play better on the court. Avery’s personality has been a perfect fit for the Avs, who despite representing a fairly small college, always pack a large and loud crowd at their home games. As much credit as Avery deserves for his success, he is the first to admit that he has had a lot of help along the way. Avery’s parents have come to every home game the Avs have played this year and his grandparents made it out to his first weekend playing a full match. Academically, Avery is working on his kinesiology diploma and then is planning to transfer to university to finish his degree. He’s enjoying the program but is most thankful for COTR giving him a chance to keep playing the sport he loves. Avery is happy with the way the team has been playing and says he can envision a top-three finish for the Avs at Provincials. While he’s hoping to get to play more, he’s satisfied with whatever role the team needs from him. As for his vocal presence, he’s definitely not going to become introverted anytime soon. He might think twice about spelling out the entirety of ‘College of the Rockies’ in a repeat-after-me chant again, though.